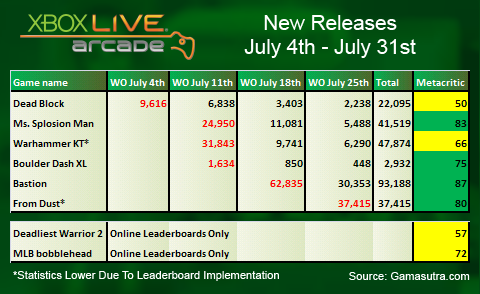 Gamasutra editor Ryan Langley has released his Xbox Live Arcade sales analysis for the month of July. July marks the start of the Summer of Arcade promotion for 2011, so that would suggest solid sales numbers. The leader of the pack this month was Bastion, which kicked off Summer of Arcade with 62,835 downloads and over 93,000 in its first two weeks. We were very impressed by Bastion, as was apparent in our review. We were also able to pick the developer’s brain in our XBLAFancast’s special Bastion episode. The game that had the second best opening week is another Summer of Arcade title, From Dust. From Dust sold 37,415 in its first week as far as we can tell. Ryan explained that the leaderboards are only implemented to show the leaderboards for the challenge mode and not the standard game. This is a good sign since the sales data is incomplete, meaning From Dust likely sold quite a bit better than the number indicates. As we reported earlier, From Dust had the best Day One sales for any XBLA Ubisoft title. The title is a unique strategy game that has had a wider range of opinions on it than most, and you can read about our thoughts on it in our review. With Ms. Splosion Man, Warhammer 40000: Kill Team, Boulder Dash XL, and Dead Block rounding out this month’s releases, it looks like most XBLA fans are staying in the air conditioning and in front of their 360s this summer. Total sales for the six releases was 245,023 with a quarter of a million new games downloaded in July. The only sales-dud in the group was Boulder Dash XL, which is unfortunate because we encouraged people to buy it and only 2,932 did. It was also good to see that some of last month’s titles are continuing to sell well with Magic 2012, Trenched and Torchlight all selling over 30,000 in the month of July. Nothing sold as well as last year’s Summer of Arcade release, Limbo, which sold 166,243 in its first week. All things considered, it seems like it has been a good month for XBLA games. For more analysis on XBLA sales, check out Ryan Langley’s article at the link below.